A wonderful cheesy recipe with a mild sauce. 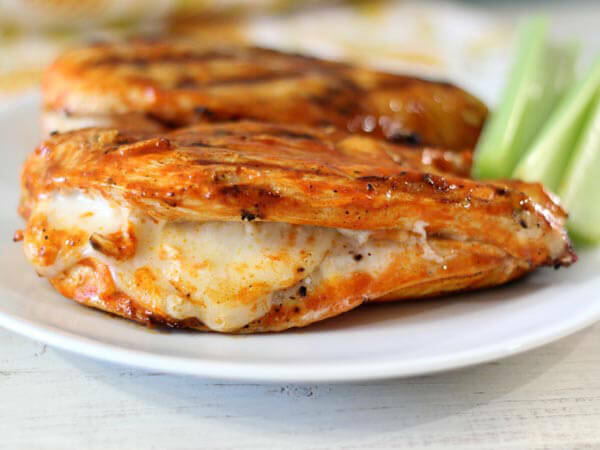 You need just 5 ingredients to prepare this Grilled Cheesy Buffalo Chicken. A perfect dish to serve in dine. Cut the chicken horizontally that it remains one piece. Season inside part of chicken with salt and pepper. Stuff it with cheese and press tightly. It should look like the chicken breast before cutting it. Melt the butter and stir in hot sauce and salt. Dip one side of chicken breast in hot sauce and place sauce side down on grill. Cook about 8 minutes. Apply sauce on top side of chicken breast and flip the side. Brush remaining sauce and cook about 6 minutes or until chicken tender from both sides.